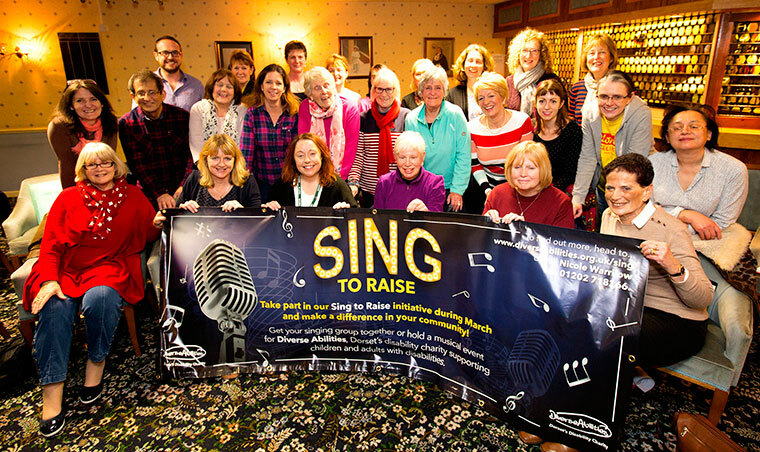 From Boscombe through Wimborne to Weymouth, established choir groups, pubs, individuals, bands and schools are all undertaking singing in various ways to raise funds for the Dorset disability charity Diverse Abilities. Members of the public are invited to attend the music events taking place, and most are free – the charity is just asking people to make a small donation during the performance. A launch event is kicking off the Sing to Raise month-long initiative in Wimborne Square on 3 March between 10am and 5pm, kindly sponsored by Wimborne BID. Nine choirs, including ‘The 6 ‘o’ Clock Choir, will be singing during the day, plus some people the charity supports. Some other performances throughout March include: live bands playing in Wimborne Town Square, organised by The Polly Morris Band (10 March); live music events at The Boot Inn in Weymouth (6 March) and O’Neill’s Bournemouth (22 and 24 March); tribute act Oasiss at the Famous Old Spa in Weymouth (29 March) plus open-mic nights at Oddfellows in Wimborne (19 March) and Chaplins & Cellar Bar in Boscombe (7 March). If you’d like to know more about Sing to Raise visit www.diverseabilities.org.uk/sing or call Nicole directly on 01202 718266.